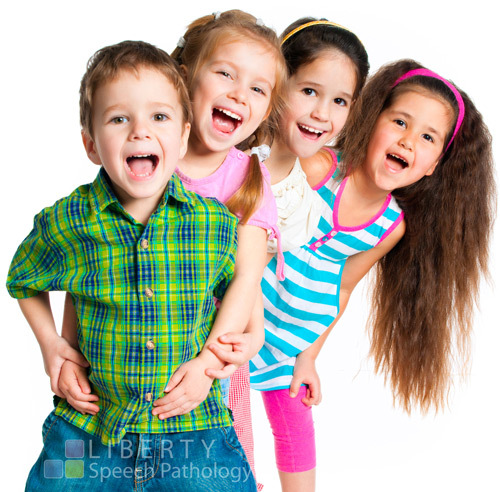 Liberty Speech Pathology can provide screening assessments to whole classes at school or on an individual basis at the Liberty Speech Pathology clinic. The purpose of a screening test is to identify speech, language and reading difficulties as early as possible, so that they can be treated sooner rather than later. If help is given in fourth grade, rather than in late reception, it takes four times as long to improve the same skills by the same amount. Many children begin school without having developed the phonological awareness skills that are necessary for reading development. Phonological awareness (the ability to perceive and manipulate sounds in words) is a skill that develops around age 4 and continues through reception, even without explicit teaching. However, some children don’t pick these skills up. Children with phonological awareness deficits often go on to use alternative strategies to learn to read, without actually learning how to decode words. They may use visual pattern recognition, context, pictures and memory to appear to be reading adequately. These children are often good with sight words and can appear to read texts accurately. They can often make it through to year 2 or 3 before it becomes apparent that they are having difficulty with reading. By this time, there is a lot more time and work that needs to go into treating a student’s literacy difficulties: teaching phonological awareness and re-teaching them all of the decoding rules they missed in their first few years of schooling. If a phonological awareness deficit is picked up early, then the therapy involved is a much faster process. The screening program is designed to screen reception and year 1 children (or older students who are considered at risk) to see if they have adequate phonological awareness skills and/or decoding skills. The purpose of screening programs is to identify difficulties as early as possible. Phonological awareness is a foundation for literacy success and a deficit in this area is a significant indicator for ongoing difficulties learning to read. Note: Many children who go on to be diagnosed with dyslexia and/or Auditory Processing Disorder have phonological awareness difficulties. Many children who have had speech (articulation and phonology) difficulties, even those that have been remediated, will also have difficulties with phonological awareness. The class screening programs include a classroom report for each class, detailing the overall class strengths and weaknesses, with suggestions for classroom approaches to working on the overall class areas of weakness. A letter is sent to each parent, indicating whether their child is within normal limits, or presents with difficulties in phonological awareness, speech, sequencing, language, etc. The clinic screening program includes the letter only. If a difficulty is picked up for a student, Liberty Speech Pathology will recommend further assessment and offer individual therapy sessions.